Islamabad - The 28th death anniversary of Imam Khomeini, the late founder of Islamic Revolution of Iran observed across Pakistan to pay tribute to the late leader. Ceremonies were held in all consulates and cultural centers of Iran across Pakistan to commemorate the death anniversary of Imam Khomeini. 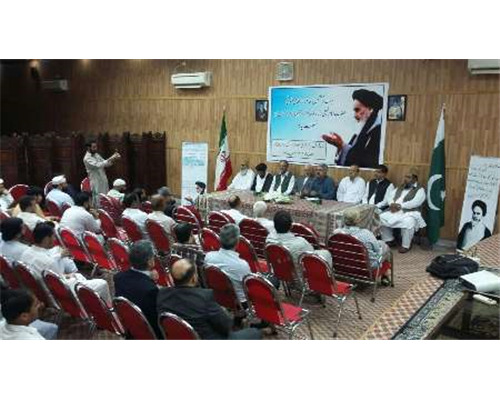 Large number of religious figures, Iranian diplomats, scholars, analysts, students and many lovers of late Imam’s ideas attended the programs held in Islamabad, Karachi, Lahore, Peshawar and Quetta and paid homage to the struggle of Imam Khomeini. Speakers in their remarks said that Imam Khomeini influenced whole of the Muslim world adding that he was symbol of Muslims unity. They said Imam Khomeini was against the forces of oppression and he always defended the rights of oppressed and downtrodden people. Speakers added Imam Khomeini with his great struggle and leadership had brought an Islamic Revolution in the country and frustrated all the designs of imperialist forces against Iran. They added Imam Khomeini had shown to the world that Islam and politics cannot be separated. Speakers believed that Imam Khomeini re-established religion of the Holy Prophet and enlightened his people through his knowledge. They noted that teachings of late Imam are eternal and if followed in letter and spirit the Muslim world can overcome all of its challenges. They urged the Muslims to remain vigilant against the conspiracies of the enemies of Islam and unite for the stability in the Islamic world. They warned that enemies of Islam are trying to divide Muslims through different conspiracies, that is why Muslims must follow the teachings of Imam Khomeini to encounter conspiracies against them. Scholars and analysts in their remarks said that Muslims of the whole world should be proud of a great leader like Imam Khomeini.